George F. Will is one of the best known conservative commentators writing for a major daily newspaper. And, he makes no bones about his appreciation for the Chicago Cubs, who in the past few days have reached the next milestones in what should, by all rights, be their Brigadoon Year (go ahead, click the link — it’s one of my favorites, and you read it here first!). Mr. Conservative Pundit George F. Will had some very cogent observations regarding the character of one John S. McCain, Republican presidential candidate. Unexpectedly, at least to this progressive observer, and to others who have picked up on this today, Mr. Will is not happy with Sen. McCain. Senator, the chairman of the Securities and Exchange Commission regulates the stock-related activities of publicly traded corporations. It’s the Federal Reserve, and the other regulators of the banking system, as well as legislators charged with that responsibility, SENATOR, who should be castigated for allowing the banks to act so reprehensibly and irresponsibly. And, Senator, that’s castigated, not decapitated! These are calamitous times. Henry Paulson is not content with mortgaging our children and grandchildren — he’s grasping down four or more generations of indebtedness: $2,333 for every living man, woman and child in the U.S, and the meter is still running. Somebody revoke this man’s license to practice economics! Meanwhile, the electorate is learning more every day about its candidates (with the glaring exception of Gov. Palin, sealed tight in her protective media-free bubble lest anyone have a chance to learn once and for all that, underneath the gun-toting, Creationist, abstinence teaching — except at home — retro hairdo is … nothing at all). Will’s bottom line: Obama lacks experience; but a bright Columbia University and Harvard Law graduate has the diplomas to prove that he is educable. 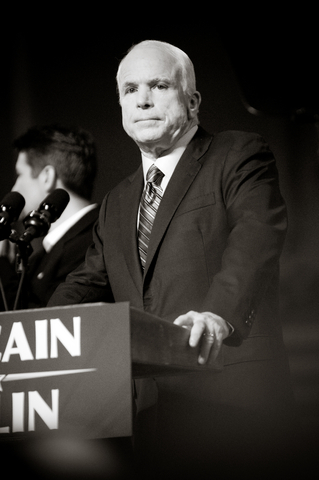 McCain’s shoot-from-the-lip impulsiveness is a dangerously destructive character defect. Bottom of his class at the Naval Academy, indeed. How can that be repaired? Mr. Will, I, too, am a Cubs fan. And I, too, am very much a fan of calm, but firm, reason in the face of adversity. Guess that makes us both Obama fans, too, George? This entry was posted on Tuesday, September 23rd, 2008 at 9:16 pm and is filed under Economy, McCain, Obama, Politics, Presidential election. You can follow any responses to this entry through the RSS 2.0 feed. You can leave a response, or trackback from your own site. This is my very first time I have visited your internet site. I observed a lot of intriguing stuff in your blog site. From the tons of comments on your posts, I guess I am not the only one particular! hold up the very good perform. With havin so much written content do you ever run into any issues of plagorism or copyright violation? My site has a lot of completely unique content I’ve either created myself or outsourced but it appears a lot of it is popping it up all over the web without my permission. Do you know any solutions to help reduce content from being stolen? I’d definitely appreciate it.